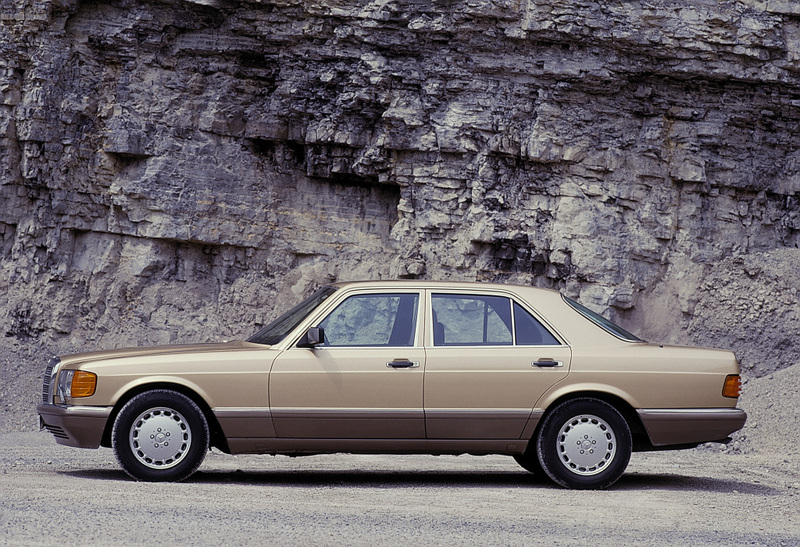 Three decades ago, two exclusive Mercedes-Benz models celebrated their premiere: The 190 E 2.5-16 (201 series) prepared the way for the then compact class to become a star performer, while the 560 SE (126 series) combined the top performance of the flagship S-Class model with the more dynamic handling of the shorter wheelbase. The top S-Class model celebrated its premiere at the International Motor Show (IAA) in Frankfurt/Main in September 1985. The 560 SEL is “quite simply the largest, fastest and best equipped passenger car currently produced by Daimler-Benz,” wrote the motoring magazine “auto motor und sport” in edition 19/1987. So was it not only logical to make this sporty, luxurious performance available in a model with a short wheelbase as well (2930 rather than 3070 millimetres)? Precisely that was achieved by the Mercedes-Benz 560 SE presented in 1988, which was likewise powered by a V8 engine with a displacement of 5547 cc and developed 220 kW(300 hp) at 5000 rpm. With the emissions control system using a three-way catalytic converter (standard equipment in Germany), the output was 205 kW (279 hp) at 5200 rpm. The 190 E 2.5-16 was conceived as a sporty high-performance saloon. Its engine was based on the sixteen-valve four-cylinder of the 190 E 2.3-16. The engineers opted for an increase in the stroke as a decisive measure to increase output to 143 kW (195 hp). Externally the sporty high-performance saloon was substantially identical to its predecessor. New features included the metallic paint finishes “almandine red” and “astral silver” as alternatives to “blue black” and “smoke silver”. In its Evolution stages I and II, of which a small series of 500 examples each was built in 1989 and 1990, the 190 E 2.5-16 was the basis for the highly successful Group A racing touring cars which AMG-Mercedes used in the German Touring Car Championships (DTM). Between 1988 and 1993 Mercedes-Benz won two constructors’ titles (1991 and 1992), and Klaus Ludwig became DTM champion in the 190 E 2.5-16 Evolution II in 1992. In 2018 the first examples of these two rare Mercedes-Benz classics will be 30 years old. This means that they can be registered with an “H” registration plate. This historical registration plate recognises original, well-preserved vehicles as technical and cultural heritage, and it is also accompanied by tax concessions. The “H” registration plate was first issued 20 years ago, in summer 1997. In that first year a total of 13,500 classic vehicles were registered. Since then the enormous interest in automotive classics has made this historical registration category a real success story: on 1 January 2017, there were a total of 430,590 vehicles registered with an “H” plate in the Federal Republic of Germany. According to the German Road Transport Authority, this represents an increase of more than ten percent compared to 2016. Der letzte Mercedes-Benz 190 E 2.5-16 (1988 bis 1993) der Baureihe 201 verlässt am 17. Mai 1993 im Werk Bremen das Band. Klaus Ludwig, amtierender Deutscher Tourenwagen-Meister, legt bei der Endabnahme symbolisch Hand an. Denn seinen Titel holt Ludwig 1992 mit dem Rennsport-Tourenwagen 190 E 2.5-16 Evolution II, welcher auf der Hochleistungslimousine basiert. The last Mercedes-Benz 190 E 2.5-16 (1988 to 1993) of the 201 series left the production line in Bremen on 17 May 1993. Klaus Ludwig, the reigning DTM Champion, symbolically lent a hand during the final inspection. This is because Ludwig won his 1992 title with the 190 E 2.5-16 Evolution II racing touring car based on the high-performance saloon.